Here is a screen shot of the mod I have made for my WWI block war game. This is from today's play test against Bill Lawson. This game arrived today after buying it from Ebay. It is in top condition and is a game I have been after for a while. Based on extensive historical research*, I'm pleased to announce the (re)discovery of a method of wargame production that would dramatically reduce costs to the consumer. For those who read my original post name under this post title, this will make sense, to the rest it will not. I have removed the original post to avoid anymore upset to Paul and to avoid anyone else downloading his game for free ( and to those of you who have no idea about this, it was not me making his game available to download), as this would also be unfair to Paul and his business. At 17, Howard's interest in flying was sparked when he saw a fliers performing in their flying circus. By 18, he had saved up enough cash to buy a biplane. In those days learning how to fly was often self taught. 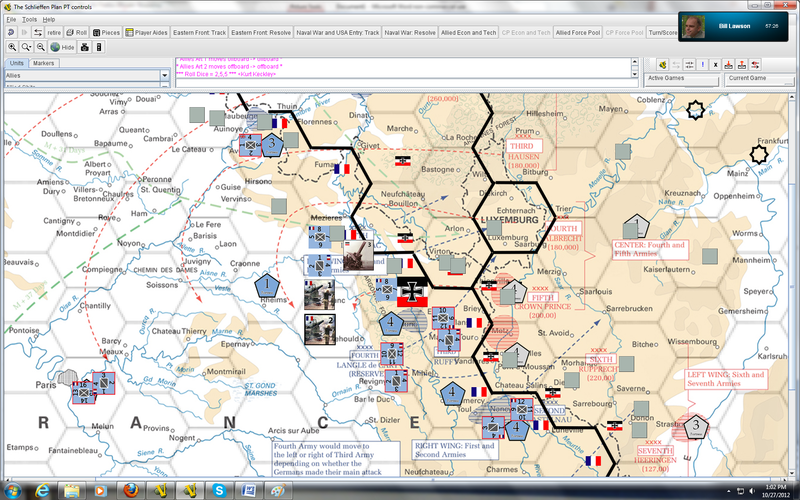 My review of Christopher George Lewin, War Games and their History(Stroud: Fonthill Media, 2012) is now available on PAXsims. Newsweek magazine has the latest entry into the ever-growing field of policy-oriented seminar wargames regarding a potential Israeli attack against Iran. The four Games I ordered from HFD arrived today. Looking forward to getting these babies mounted. & one free game called The Battle of Anloc. Any thoughts on this new TPS game? The cover at least is superb. I've never played a game on this operation, but I know Vae Victus has something out there.......this is definitely something I could sink my teeth into. I've been supremely hacked off at Phormio since I first read Thucydides: Idiot!! Just about everything you'd ever want to know about Canadian Military history; This is a tremendous resource. Line of Fire #13 is on preorder. This magazine focuses on Nations at War with articles, scenarios, and a sneak preview of the East Front edition, Stalin's Triumph.